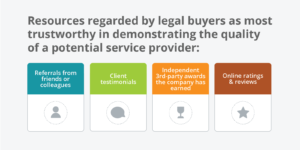 According to Thomson Reuters, demand for legal services is up nearly 2% since 2017, and our own legal market research shows that most existing corporate clients expect to need more assistance from law firms in 2019, with 47% reporting that they expect an increase in legal needs this year. These numbers indicate an opportunity for law firm growth and expansion, but findings from our 2019 Legal Buyer Benchmark Study also depict a high risk of losing revenue and share of wallet with existing clients. For example, more than three-quarters of law firm clients — yes, 76%! — would be willing to work with another provider if it were recommended to them by someone in their network. So how can law firms capitalize on increasing demand while also fortifying against client churn and loss of revenue within existing accounts? Better yet, how do you become the firm that gets referrals and wins business away from less-than-stellar competitors? It all comes down to the client experience. Our research shows that corporate legal clients put serious research into the firms they do business with. And when vetting a firm? Referrals are a buyer’s No. 1 resource. 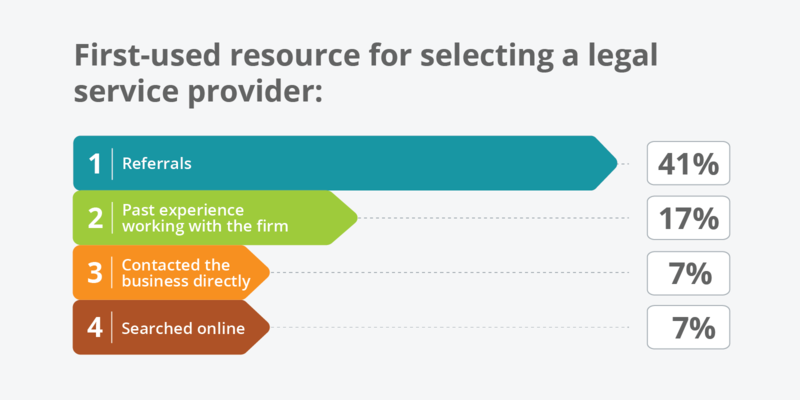 More than 2 in 5 corporate legal buyers say referrals are their first-used resource when vetting potential law firms to work with. After that, it’s past experience with the provider, direct contact with the business, followed by online searches. Trends outside of the industry back up this dynamic, with Forrester and Gartner predicting that by 2020 (next year!) B2B buyers will be 80 percent of the way through their decision-making process before ever touching base with a service provider. What does this data tell us? Something you’ve known for a while, which is that the best tool in your marketing and BD arsenal is a strong referral – one from an existing or past client who not only had a positive outcome, but a positive experience on their journey towards that legal outcome. But referrals aren’t the end of the client research journey. Though a referral offers you the greatest chance of being considered by a prospect, it doesn’t guarantee you’ve won their business. Our data shows that after being referred to a law firm, 91% of buyers will conduct additional research. Of those, 71 percent will ask others in their professional network about the firm. Another 70 percent will go to the provider’s website, and a whopping 60 percent will seek out online reviews of the firm. What are legal buyers looking for in their research and due diligence when vetting prospective law firms? Our study shows that quality of service is the top priority, followed by proven industry expertise. 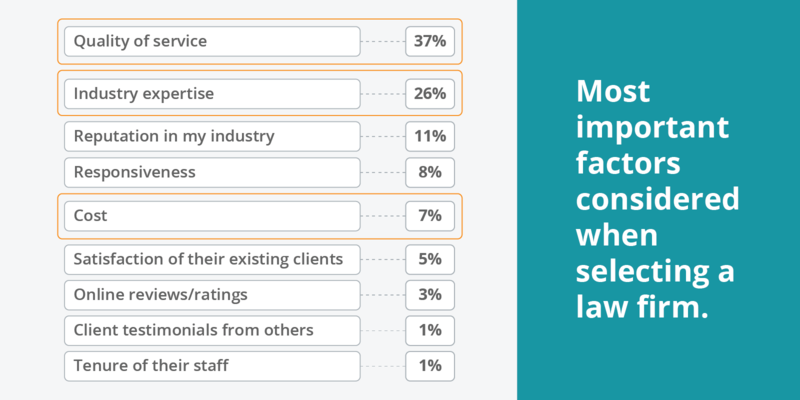 Only a small fraction of clients say cost is a high-priority concern. While your website and other branding and marketing materials are an obvious channel for communicating your firm’s service quality and expertise, our research shows prospective clients perceive them to be less-than-credible sources of information on the matter. At the very, very bottom of the list are your website (just 6% of legal buyers voting this as the most trustworthy resource in determining the quality of your firm), your marketing materials or advertisements (3%) and your social media posts (2%). The growing relevance of online reviews for law firm buyers is a lagging indicator of a dynamic that has (and will continue) to drive the winners (and losers) in the legal industry. And that is – what other people have to say about your firm matters more than anything you could say about yourself. And in particular, buyers want to hear from your clients. But how are your clients talking about your firm to their networks? Are they talking about you? And if so, what are they saying? Believe it or not, there are proven strategies to answer these questions that measure the “referrability” of your firm while identifying service wins and getting ahead of client churn issues. One of the leading strategies is the Net Promoter® client survey methodology. 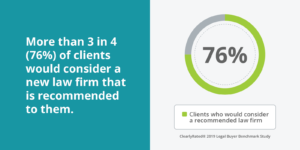 This simple client satisfaction survey program measures your firm’s reputation by asking clients how willing they are to refer your firm to a friend or colleague. What’s more, by identifying your most satisfied clients, you can begin to build a strategy that leverages their voices for firm growth in the shape of reviews and testimonials. ClearlyRated is a leading provider of NPS for professional service providers. We’ve published a number of resources to help law firms navigate their client survey journey, and we’d welcome a discussion about implementing NPS at your firm! If you are interested in discussing a client survey initiative at your firm, please don’t hesitate to contact the ClearlyRated team or call us at 1-800-921-2640! Kat Kocurek is the VP of Marketing at ClearlyRated, a leading provider of satisfaction surveys, service quality research, and online ratings for B2B service providers.